I am writing this as an endorsement and character reference on behalf of Holli Rovenger. I have known Holli for a couple of years socially and have discussed and worked with her on professional matters, as well. I find her to be a charming and engaging woman who is passionately involved in the cause of promoting womens’ rights. She is highly intelligent, has great integrity and is a person who anyone should be proud to be associated with. I have known Holli for some time now and have been following her “How to be Nice to You” program.It is incredibly important to be nice to yourself, but it is so easy to be last on the list. Holli reminds you to take care of yourself. She is also a great coach, nutritionist and offers brilliant advice about looking after your finances. Holli is a true advocate for women everywhere and I couldn’t recommend her highly enough. 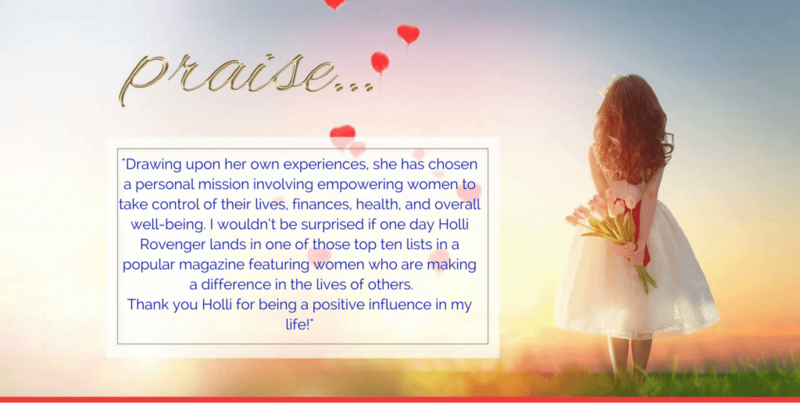 Holli has given we women a helpful road map on how to care and nurture ourselves with joy and ease. She gives practical, easy activities to integrate into our lives, to help bring our awareness and attention to developing our inner and outer beauty.In our fast pace society where we can easily lose sight of adding self care into our routines, Holli makes the habit come to life. By following her expert guidance you can feed your body and soul with golden nuggets to transform your body, heart and mind. I have known Holli Rovenger for well over 10 years. She approaches her clients and friends with excitement and enthusiasm, and brings a wealth of knowledge to every conversation. Her professional training as a dietitian, and her self-taught education in Finance and Independent Thinking, makes her uniquely qualified to assist, counsel and train people with the difficult task of self-improvement, healthy eating and enjoyable living. I wholeheartedly recommend Holli and her exciting program to all people who battle their waistline. How life altering it is to be reminded that true bliss can come from a smile, a walk in the park or a quick nap! While Holli also recommends more indulgent pursuits such as a massage or seeing a show, it is the joy-invoking activities such as dancing in your own house or connecting with an old friend that were a wake-up call for me! I don’t need a lot of time or money to be blissfully happy. During the past 3 years of my acquaintance with Holli Rovenger, I have known her in many capacities. She is devoted to her work and to the women’s community; and she is enjoyable to be around. She is well organized, efficient and extremely competent in the business and financial world. She provides many useful tools to help women achieve financial security and stability. I have learned so many valuable tips from her. She really has a passion to encourage and support women to take action and raise their hands more often with confidence. I appreciate Holli’s mission to help women fill these objectives!